If you are a full time or part-time caregiver, you deserve (and need!) a vacation every once in a while. Caregiving is a demanding job, so you shouldn’t feel guilty about taking a break. Taking the time to rest and recharge will help not just you but your loved one as well! One of the challenges facing caregivers is finding someone to care for their loved one while they’re away. If you’re thinking about planning a trip, here are a few senior respite care options to ensure that your loved one is well cared for in your absence. Even if they’re not involved in the primary caregiving, your family members may be willing to take over your responsibilities while you’re away. Many family members are happy to do this since it’s a great way to show appreciation for all that you do in caring for their loved ones. Even if no one has offered, don’t be afraid to ask. It could be that they want to help out but hadn’t thought of this as a way to be of assistance. Don’t assume that family members who don’t live nearby aren’t available to stay with your loved one. Some might be willing to travel some distance to help. They may even look forward to the opportunity to spend some quality time with their loved one while you are away! If your loved one doesn’t require 24-hour care, in-home services may be the best option. Depending on your loved one’s needs, someone can visit to help with personal care. This includes services such as dressing or bathing. You can also get assistance with meal preparation, shopping, laundry, or cleaning. 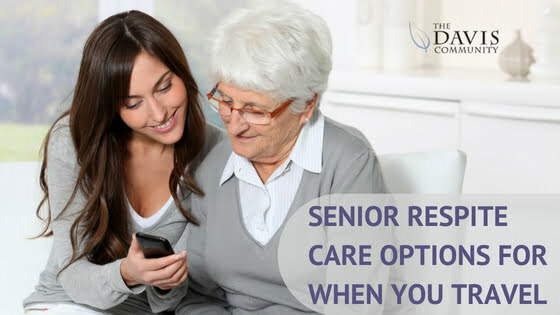 You may find the kind of help you need through a home care agency. Or you could check with your local Area Agency on Aging to see what organizations and options are available in your area. Many assisted living communities, skilled nursing facilities, or adult daycare providers offer short-term care options. This allows the caregivers to get away for a bit and enjoy some much-needed rest and relaxation. Oftentimes, they will care for your loved one for a week, or even a weekend, without any further obligation. Depending on the facility, you may pay by the day, by the weekend, or by the week. While staying at a senior living facility, your loved one will be able to enjoy comfortable accommodations, nutritious meals, as well as social opportunities and other events. You will enjoy peace of mind knowing that they are being well cared for while you’re away. If a stay at a senior living facility doesn’t work within your budget, consider applying for a grant. For example, the Alzheimer’s Foundation of America offers a limited number of grants to families caring for loved ones with Alzheimer’s disease or dementia. There are application deadlines, so it’s important to plan ahead. Click here for more details. This entry was posted in Concierge Care and tagged Respite Care. Bookmark the permalink.